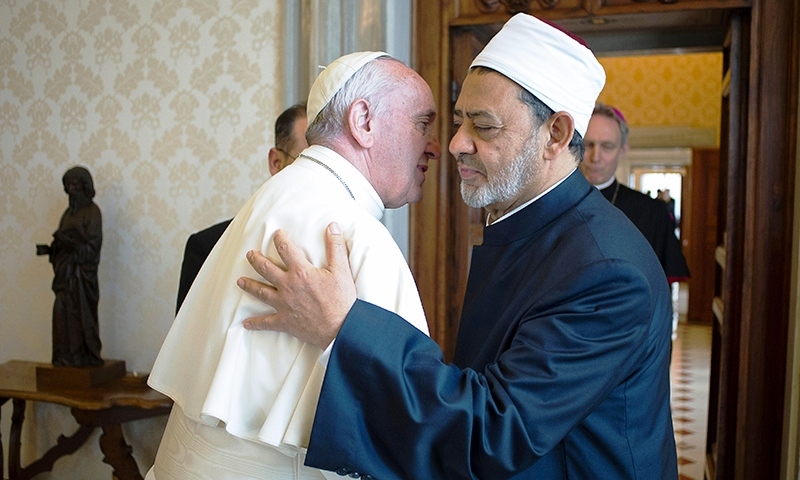 During his visit to Egypt last week, “Pope Francis visited al-Azhar University, a globally respected institution for Sunni Islamic learning,” and “met with Sheikh Ahmed al-Tayeb, the imam of the government-run Al-Azhar mosque and an Islamic philosophy professor.” This has been reported by several media, often with much fanfare. The reformer knows what he speaks of; in 2015, al- Behery’s televised calls to reform Islam so irked Al Azhar that the venerable Islamic institution accused him of “blaspheming” against Islam, which led to his imprisonment. Now Behery says that, ever since President Sisi implored Al Azhar to make reforms to how Islam is being taught in Egypt three years ago, the authoritative madrassa “has not reformed a single thing,” only offered words. “If they were sincere about one thing, they would have protected hundreds, indeed thousands of lives from being killed in just Egypt alone,” said al-Behery. By way of examples, the Muslim reformer pointed out that Al Azhar still uses books in its curriculum that teach things like “whoever kills an infidel, his blood is safeguarded, for the blood of an infidel and believer [Muslim] are not equal.” Similarly, he pointed to how Sheikh Ahmed al-Tayeb claims that ISIS members are not infidels, only deluded Muslims; but those whom they kill—such as the bombed Christians—are infidels, the worst label in Islam’s lexicon. Debating Behery was an Al Azhar spokesman who naturally rejected the reformer’s accusations against the Islamic madrassa. He said that the source of problems in Egypt is not the medieval institution, but rather “new” ideas that came to Egypt from 20th century “radicals” like Hasan al-Bana and Sayyid Qutb, founding leaders/ideologues of the Muslim Brotherhood. The man who kills himself [Islamic suicide bomber] today doesn’t kill himself because of the words of Hassan al-Bana or Sayyid al-Qutb, or anyone else. He kills himself because of what the consensus of the ulema, and the four schools of jurisprudence, have all agreed to. Hassan al-Bana did not create these ideas [of jihad against infidels and apostates, destroying churches, etc. ]; they’ve been around for many, many centuries…. I am talking about Islam [now], not how it is being taught in schools. There is a short distance between what is written in all these old books and what happened yesterday [Coptic church bombings]—the real bomb is in the books, which repeatedly call the People of the Book “infidels,” which teach that the whole world is infidel… Hassan al-Bana and Sayyid al-Qutb are not the source of the terror, rather they are followers of these books. Spare me with the term Qutbism which has caused the nation to suffer terrorism for 50 years. The bottom line, according to Behery, is that the Egyptian government—and here the Vatican would do especially well to listen—cannot rely on Al Azhar to make any reforms, since if anything it has taken Egypt backwards.